Yesterday Scott Guthrie announced WebMatrix, a new tool from Microsoft which lowers the barriers to entry for creating your own .NET based website. It features all the newest Microsft treats which Guthrie has introduced over the last week: IIS Express, Compact SQL Server, and Razor. Two big complaints: the Publish functionality wasn't working well for me (I update to an ftp site, WebMatrix updates *all* files everytime) and my site doesn't render perfectly in the browser (css-related stuff, not sure if it's an IIS Express). Trying to load a .php page, I recieved a HTTP 404.3 error: "The page you are requesting cannot be served because of the extension configuration. If the page is a script, add a handler. If the file should be downloaded, add a MIME map." The handler is not present! I spent quite a bit of time trying to manually update the .config file (I think I was updating the wrong one - %WebMatrixInstall%/config/applicationHost.config?? Anybody know?) before finding this post which details how to add a php handler to IIS 7.0 and IIS 7.5 (and IIS Express, which is based on IIS 7.5) via appcmd.exe. Open a command prompt at your WebMatrix install directory (mine is "C:\Program Files (x86)\Microsoft WebMatrix"
For the following command, replace the scriptProcessor parameter with your proper path to php-cgi.exe and run: " appcmd set config /section:handlers /+"[name='PHP_via_FastCGI',scriptProcessor='C:\Program Files (x86)\PHP\php-cgi.exe',path='*.php',verb='*',modules='FastCgiModule',resourceType='Either']" "
All in all, I was very impressed with WebMatrix and IIS Express. 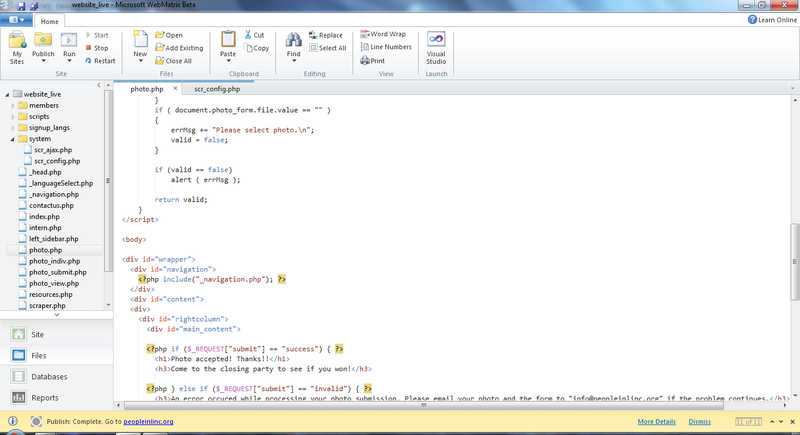 I'll be using WebMatrix to manage my PHP site in the future and I hope to play with Razor and SQL Express soon! 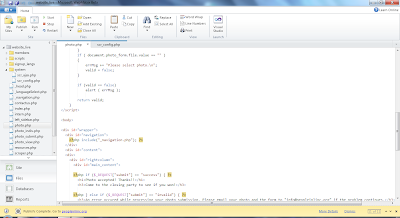 "programing nightmare: webmatrix php editor"
I use and suggest Codelobster. It is free, it works fast and smart.